I've mentioned before what a great job the Kansas City Chapter of JDRF has done with embracing the message of outreach for adults with Type 1. 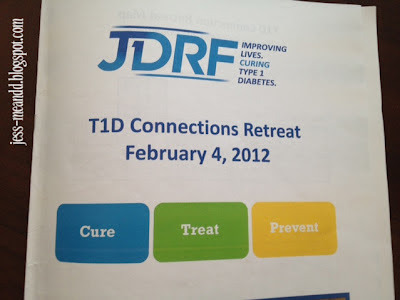 Last Saturday, February 4th (yes, #Febtoberpalooza Saturday) I attended their T1D Connections Retreat. This year, they featured an adult track for the first time. Before I continue, I need to take a moment and thank Kim, Brian, Sara, and C for spending part of their vacation attending the event. I felt the need to go support what my local chapter was doing, but was conflicted about it since my friends were going to be here. So a huge thanks to them for being such tremendous sports and coming with me. I love you guys. The DOC had a good representation at the event, thanks to the four of them and also, of course, Charli, Babs, and Scott. We had fun roaming the vendor fair. A bit smaller than the Friends For Life exhibit hall (ha! ), but interesting none the less. Of course there were the booths you'd expect: Animas, Omnipod, and Medtronic. Talking to reps is always fun. And the Medtronic booth had a MySentry up and running (see also: I WANT ONE)!!!! It was neat to see one in action. The speaker at lunch was Dayton Coles, JDRF International Board Member. I really liked what he had to say. His presentation was about the new goals of the JDRF: Cure, Treat, Prevent. As C mentioned in her post, he talked about how so many people get told the cure is only five years away. And how that is not true. It's going to be a lot longer than that, which is why there needs to be a focus on treatment of diabetes as well. Like C, I really appreciated his honesty. After lunch, it was time for a few sessions. For the first one, most of us went to "We've Got An App For That." The first half was a doctor from Children's Mercy Hospital talking about Glu, a new social networking site for people with Type 1. It was neat to learn more, and I'm super-excited to try it out when it goes live soon! The doctor had to leave about halfway though the session time, so Outreach Manager R asked myself, Babs, and Scott to repeat our DOC presentation we'd given a few weeks before. The audience was a little different this time. This session was targeted for teens, so we had to tweak a few things in the presentation. There were also some parents present, so we tried to speak to both groups. I really hope that someone will be encouraged so investigate some of what the DOC has to offer. Oh, and I totally embarrassed Kim by talking up the You Can Do This Project and pointing her out to everyone (hee hee). I could spend all day talking about why the DOC is important and how you've all changed my life. Seriously. For the second session, most of us went to hear about clinical trials. It was nice to hear from someone involved in running clinical trials, since it's not something I know much about. While I wasn't interested in the specific trial they are running right now, it was great to get some more information. Like a list of questions one should ask before agreeing to participate in a clinical trial anywhere. I do hope to be able to participate in a trial at some point in time, like Abby did or Sara is considering. For the final session, we listened to fellow PWD Nan Borchardt, RD, LD, CDE. I'd had multiple people throughout the day say, "Make sure to listen to Nan. She's fantastic!" All in all, it was a great day. Huge thanks to everyone at JDRF Kansas City for including adults with T1 in the day. Next year, I hope to see some more of the workshops targeted specifically at adults, and more adults in attendance. But it was a great first effort. Way to go, team! 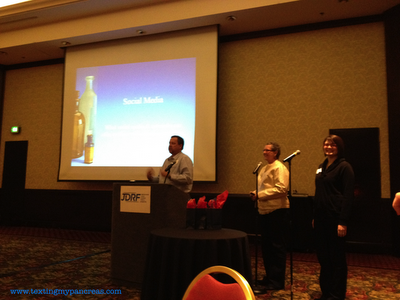 *I chose to blog about this event because I'm excited about what JDRF Kansas City is doing. 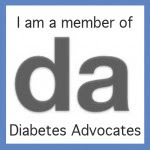 No one from JDRF or any other organization or company asked me to write about it. I paid all expenses involved in attending the retreat myself. That is cool. I wish Dallas had more for adults with type one. Sounds like a great time, Jess! Very impressive what your KC Chapter has going - many can learn from them! Thanks for attending, with some of the DOC crew, and sharing the story here! what a great wrap-up! so many links! thanks for sharing your experience. i really wish my local jdrf had more events like this. though, i did just get an email invite to a mysentry open house thingy, so that's a step in the right direction.